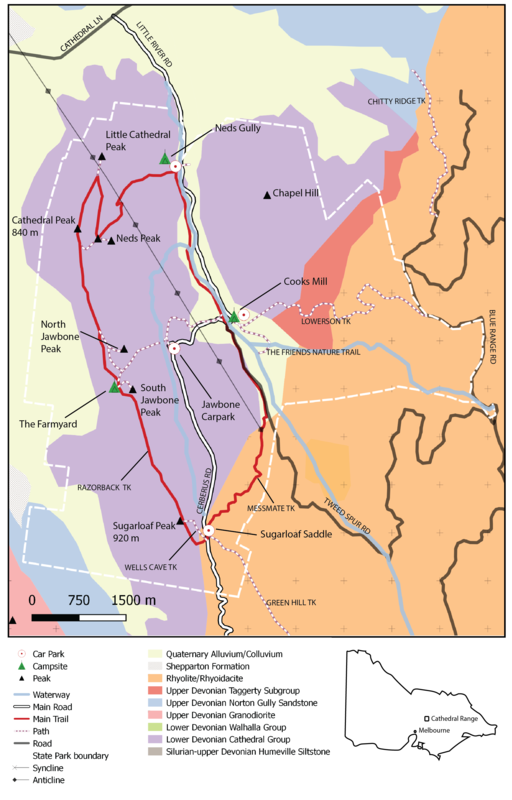 The Cathedral Range State Park is located approximately 100 km north-east of Victoria (see map below) near Taggerty, VIC. The area is popular for rock climbers, bush walkers and hikers, with a number of trails winding through the geology and rewarding 360 degree views of the landscape. Me hiking in the Cathedral Range State Park. In some places you can go off-path and just scale the side of the ridge! The local geology of the area mostly consists of sedimentary and volcanic formations originating in the Devonian (400-350 Ma) which resulted from extensive deep marine sedimentation. The Lower Devonian (oldest) was a period of rising sea level (like what we have now). Victoria was not as we know it today, in fact most of it was underwater and land was still being formed progressively from west to east. The Cathedral Ranges was mostly still deep marine with periodic episodes of extension causing volcanism. The purple in the local map below and the rocks in the image above are termed the Cathedral Group. These sedimentary rocks were the last to be deposited in the Devonian, just before or during a major period of east-west shortening termed the Tabberabberan Orogeny which is widespread all over Victoria. This is what was responsible for raising the area above sea level and tilting it vertically! The Ridgeline – uplifted and tilted Cathedral Group. Photo source: James Davies. The Cathedrals are much more interesting however than a package of sandstone and mudstone. See the orange colour in the local map below? This is a massive package of rhyolite and rhyodacite – rocks that form from granitic magma which has pushed its way up from deep in the earth to either flow overland or cool in the subsurface. Rhyolite eruptions are extremely explosive and extremely rare. It doesn’t flow like the basalt lava your used to seeing in cartoons, it’s highly viscous and very sluggish. Devonian Calderas: Archeron and Carberean. Location of Cathedral Ranges local map in inset. Source. The rhyolites and rhyodacites at the Cathedrals resulted from the collapse of an ancient caldera termed the Cerberean Caldera (see above), which forms part of a the Central Victorian Magmatic Province (~370-350 Ma). In collapse, pyroclastic eruptions from feeders along the rim and radial fractures formed the volumous rhyolite (Rubicon Rhyolite). This clip shows perfectly what occurs during the collapse of a caldera. These ancient formations were once far more impressive – before they were mostly weathered away. Streams dissect the landscape and Devonian sediments are overlain by Quaternary (recent) alluvium and colluvium (cream coloured in the map below). Local map of geology and walking paths. Click for larger image. The best way to see the rocks is by completing the Ridgeline Circuit (red trail in the map above). This is an 18.2 km long track running through Wells Cave, Sugarloaf Peak, The Farmyard, Cathedral, Little Cathedral and Neds Gully tracks. It begins and ends at Cooks Mill Campground (see map above), and can be divided into a southern and northern circuit (to break it up into two day walks). The Farmyard Campsite. Image source: James Davies. For the entire track, begin at Cooks Mill and head south up the Messmate Track towards Sugarloaf Saddle where you will see beautiful views. This part of the track travels through the Devonian volcanics (rhyolite). From here either take the Wells Cave Track (harder) or head up the Razorback Track (easier) towards the Farmyard (difficult sections in the ascent). The Farmyard is a good place to set up camp for the night. Along the ridge you should take the opportunity to have a close look at the rocks. Look for fossils (like in the picture below) and take note of the different colours (reds, yellows, oranges). Also look out for clues in the layers of rock telling us about the environmental conditions. The ripple beds below are a feature of the youngest rocks in the range – the Cathedral Beds – and tell us that at this time the area was shallow marine or partly non-marine. From here you can head back to Cooks Mill for a half day hike, or if you want to continue right through, you can check out South and North Jawbone Peaks before heading to the Cathedral Peak. You then take a steep descent to Neds Gully, along the river track and back towards Cooks Mill. There are a number of spectacular walks which cut through the park, and I would recommend consulting Parks Victoria before heading out, as well as checking forecasts and conditions. Another popular activity in the park is rock-climbing. There are a number of different climbs of varying difficulty scattered around the park. It’s important to do your research properly and, if you’re unexperienced, head out with an experienced group or club – like I did (Monash University Outdoors Club).